A bride-to-be filmed herself fatally drinking poison and sent the clip to her ex-boyfriend after he allegedly blackmailed her. 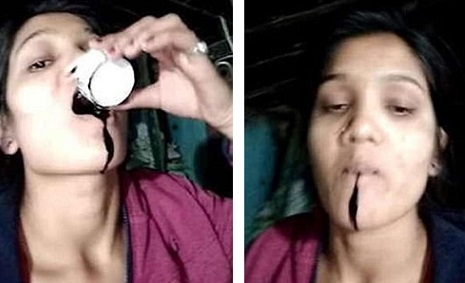 The young woman, named as Nisha Devidas, is seen drinking a thick black substance in the video at her home in the village of Rohini in the western Indian state of Maharashtra. She was ten days away from getting married to a man unnamed in reports when she died. Her brother Ravi Kavle claims she was sick of being blackmailed by her ex-boyfriend Nikhil Borkar and decided to take her own life. Her grieving brother Ravi was quoted by local media as saying: 'My sister's wedding was due on February 4 but she embraced death just ten days before her marriage. 'A youth named Nikhil Borkar is responsible for my sister's death. He lured my sister on the pretext of marriage, then used her and started blackmailing her. He said his sister took her own life because she was 'fed up and defeated' and he demanded that Nikhil should be 'immediately arrested'. The nature of the alleged blackmail was not stated.